As I’m starting this review I am only half way into the 14 tracks that make up ‘Artgod Dogs’ and I have already been surprised, reeled in wonderment, and frankly shed a tear at the sheer brilliance of the songs on this album. I’ll get back to the review proper in a moment but first let me tell you that when the band’s manager got in contact to ask whether I could review this new album he told me that ‘the violin is back’, huge news for me, a fan of the original string driven sound – although looking at the band credits it’s credited as a viola which goes some way to explaining some of the sound tones we hear. It sears, it saws away in the background, at times adding this sort of manic folk feel to some of the tracks. Look, as I said there are 14 songs on this album and I can’t do them all justice in this review. If you bump into me at some gig somewhere and you have say two or three hours, I’d be happy to tell why this is so so good in – perhaps excruciating – detail and why you must listen to it but for the purposes of this I’m going to concentrate on my highlights. Where I think it’s important, or in some cases just because I feel like it, I’ve said what I think the song is about. The words are great, honest. But in some cases they are the sort of lyrics that could be interpreted in as many way as there are listeners, which isn’t a bad thing at all, I love those sorts of lyrics. Broadly speaking the sound – bar the viola of course – follows on from the previous release ‘Manco Diablo’. It doesn’t have some of that frankly heavy rock riffage of that album. It’s sort of heavy in places but, I don’t know, it’s more ‘Stonehenge Free Festival’ to my admittedly old ears (I’m not that ancient by the way, just older). Look I’m making this sound retro, it isn’t, it’s way up to date both in sound and song content but it has this thing going on, OK? And as will you find out there are songs that just come out of bloody nowhere, that are just so unexpected that they make you reel. ‘Cut Throat Living’ is perhaps more, let’s say, rocky, more guitar driven but there’s that viola there adding that certain extra thing. The song could be summed up lyrically as being about the grind of working to live and what that does to you. It’s one of the tracks on the album that I keep going back to. And it’s hard to say exactly why, perhaps it’s that dropout section where the vocals go all echo-y, perhaps it’s the violin sawing away. Whatever it is, it’s got me hooked. The song ‘Storm Linda (Part 1)’ is one of my favourites. It took me completely by surprise on my first listen through. And even with the words in front of me I still can’t work out what it’s about. It’s this delicate, sort of psychedelic thing, at least at first – think sort of early Floyd or even Gong. The viola on this is so so haunting. It changes, it’s less delicate but it’s still a trip people. There’s this pulsing guitar that swirls in your head. The drumming on this track is just brilliant. And those vocals, light and delicate one moment, fuzzed and echo-y the next. Wonderful stuff. ‘Goya, Pinter, Honey, Bed’ is this big rocky – sort of space-rock – track with this quite quite fantastic backing vocal. And then it’s this spoken conversation. And then it’s back to being rocky. It’s about what somebody has done that day – look at a book of Goya pictures, read some Pinter, eat some honey and then go to bed – and bizarrely the conversation is with a flatmate who’s in a band who’s been on a trip to Berlin, Stockport and Stockholm. Somehow, just somehow, I’ve got horribly addicted to this. 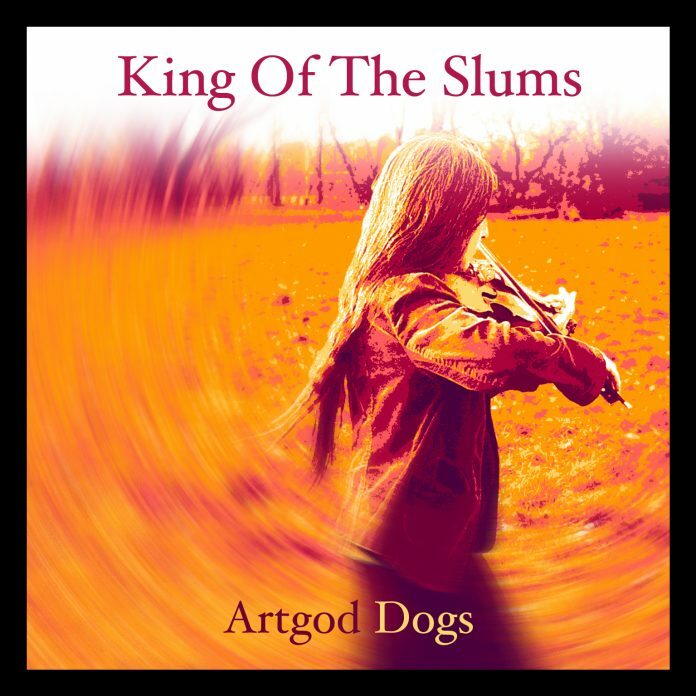 And now to ‘Dirty Little Artdog’ a track that actually brought tears to my eyes the first time I heard it. It’s simple thing, a delicate ballad sort of thing with a kind of spoken vocal. The viola is just so effective, so emotional. Quite what a ‘Dirty Little Artdog’ is and why you might want to ‘stick it in your pocket’ I have no idea, but I don’t care. This song is just so moving, even though I don’t know what it’s about, it’s that well done. Small update – having listened to the song for way too many times, I think it’s just a song about a pet dog and taking said dog to an art gallery (yes really). I say ‘just a song’ but it isn’t ‘just a song’ at all. It’s a tribute. So that gets us halfway through the album with my highlights. Deep breath, compose yourself Frank, onwards we go. ‘Crow Syndrome’ had me thinking poppy Here & Now. It has a groove you could lose yourself in, but it’s light, at least in places. And then the guitar just lets go. Another of my big favourites. I’ve included ‘Deathsex Reality Check’ because it was the title of the song that grabbed me first of all. But the song itself is this crunchy guitar thing. It’s another track I keep going back to time and time again. ‘Salt Of The Earth’ opens with these guitar crunches and then the violin comes in, just sort of pulsing away. The vocals come at you and suddenly it has this psychedelic section, I was so surprised by this at my first listen I had to check it hadn’t actually managed to switch to another track. But no, this is one of those tracks that just keeps changing. The fantastic thing is that while it keeps changing, it works wonderfully. The album closer ‘Diamante Swansong’ is another one of those huge surprises. It’s another of those changing songs, one moment it’s a slow sort of ballad-y thing, the next it’s a whirling rocky thing. The next it’s a viola showcase solo thing. It’s something I could imagine as a live set closer, it has that ‘let’s all lose it together’ feel. There comes a point in a review where the reviewer is supposed to make some general comments about the album and then drawn this together in a pithy sentence – the sort of thing you see bands using in their publicity. BUT I’m finding this impossible, try as I might I can’t come up with that pithy sentence. The songs on this album are songs written and played by a band who are not afraid to push the boundaries or even have any boundaries at all, so different are some of the songs or so different things can be within songs. But although they do play in a variety of styles somehow you just know that it’s the same band. The songs have this certain thing that says yes these are King of the Slums songs. To do that a band have to be good, and King of the Slums are good, the playing on this album is incredible – at one point during the repeated listening to the 14 songs I started listening to the individual instruments more closely. The thrilling thing about the viola playing is the variety of sounds you get – it sears through the other instruments, it pulses away, it saws. The guitar is just great – it crunches, it’s delicate, it swirls. The bass – where it’s prominent – is amazing. And the drumming is hugely impressive. One question you might be asking is is this a progression from ‘Manco Diablo’, and the answer, at least to my ears, is yes and no. It’s yes in that at least some of the songs could be from that album, there are things that are similar in sound and style, but somehow they are more inventive. It’s no in that some of the songs are just so different from the songs on that album that it’s almost like they mark a turning point in the band’s style. And this isn’t a return to their original sound, even if the violin/viola is back. This is a band who are progressing, going forward and not sitting on their laurels. OK so having reconsidered my pithy sentence, the best I come up with is to repeat my opening sentence. I was surprised, I reeled in wonderment, and frankly shed a tear at the sheer brilliance of the songs on this album, it’s that good. So do I recommend this, hell yes, it’s great great album with a range of song styles that really hang together, with something for everybody. If you were a fan back in day but haven’t listened to any recent stuff then get this. If the band are new to you, then give this a try, you won’t be disappointed.